Penn Waste is receiving the award for its York, Pennsylvania, 45-tph single stream system retrofit. The 2017 retrofit, provided by Bulk Handling Systems (BHS), boosted capacity 130% to 45 tons per hour. It also added NRT optical sorting technology and a Max-AI AQC robotic sorter (Autonomous Quality Control) to improve container recovery and purity. 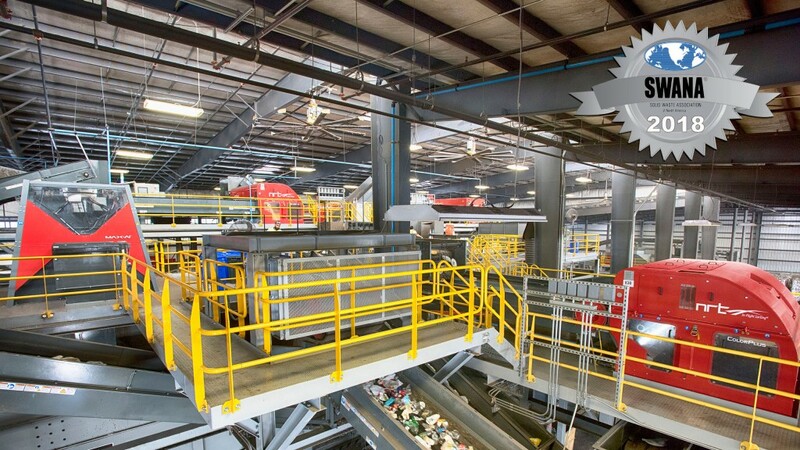 The improvements resulted in a facility able to process 18,000 tons per month with more than 98% uptime and capturing 98% of recyclables. Penn Waste said that the company did not lose a single ton during the speedy retrofit and has since been running at 100% capacity with lower operating costs. "We continue to invest in technology to boost throughput, recovery and purity," said Amanda Davidson, director of marketing. "The complete retrofit took only nine days. The results have led us to continue to expand our reach in what have become turbulent market conditions." SWANA's Excellence Awards Program recognizes outstanding solid waste programs and facilities that advance the practice of environmentally and economically sound solid waste management through their commitment to utilizing effective technologies and processes in system design and operations, advancing worker and community health and safety, and implementing successful public education and outreach programs. Programs also must demonstrate that they are fiscally and environmentally responsible through their compliance with all applicable federal, state and local regulations. Watch Penn Waste's system in action below and hear about the retrofit.